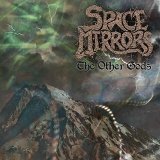 Space Mirrors, the originally space-rock brainchild of Russian keyboardist Alisa Coral, has gone in a more metal-oriented direction of late with their new "Cosmic Horror" series of albums, a series that covers the works of H.P. Lovecraft (though I notice they've been staying away from his early Poe pastiches so far). The latest, The Other Gods, still has a lot of the dreamy, spaced-out sound of earlier efforts, but with a sharp metal edge driving the songs. There's an unusually large amount of guest musicians and instruments on The Other Gods, many of whom are well-known in the space rock community, including one of the Hawkwind founders -- Nik Turner, who plays the flute and sax on a few of the tracks. Their comings and goings from track to track give the album a lot of personality, welded together by Coral's keyboards, the competent guitar work of Sparky Simmons, and Martyr Lucifer's solemn, heavily-accented bass vocals. Stranger in the Mirror starts the album off fast, with a catchy chorus...and it has a Moog in it, has a progressive-sounding mini-solo in the middle of the track -- I loved the sound of that. Nameless City, while starting quietly, has a strong, plodding beat to it, with a downtuned rhythm guitar and ominous keyboard work playing over it. Coral's songwriting here is excellent -- reinterpretations of Lovecraft stories set to strongly Russian-flavored tunes with a regular, almost industrial beat to most of them. She has a knack for letting the space rock get into the metal part just enough to make it an enjoyable change, but without totally subsuming everything in an incomprehensible mess of progginess or letting things soften to the point that the music is no longer heavy. And the songs are diverse -- She-Devil, for example, has almost an 80s New Wave sound to it, despite its heaviness, and both it and Frozen City of Cubes and Cones have a small dissonance between the vocals and music that contributes to the weird, otherworldly atmosphere and makes the more melodic choruses stronger. Occasionally songs are melodic all the way through, though the presence of so many guest musicians tends to mean they still have a lot going on. This isn't a band that focuses on tight coordination, so the feeling of the album is more that of a band jamming than anything else; but the musicians are all expert and constantly riff off one another's tunes even when going off on a solo. Times Unknown, a ten-minute epic with Turner's flute and several other guest musicians, is a great example of this. The album ends with Doom of Sarnath, and sure enough, Space Mirrors slows it down in what I'd presume to be a nod at doom metal, though they can't seem to really constrain themselves to a slow enough pace to be doomy. To be sure, The Other Gods is a somewhat chaotic album, with its stew of darkly danceable music, jamming, and dissonance, but it is also a very enjoyable one. Both the fine songwriting and musicianship of Space Mirrors really shine here, and I definitely recommend it.